The sun shone brightly on the “Head of the Town” in Strabane on Sunday as hundreds gathered to pay special tribute to the memory of local teenager Charlie ‘Cha’ Love, who was tragically killed while attending the 18th Anniversary Bloody Sunday commemoration on Sunday 28 January 1990. Charlie was fatally injured when debris from an explosion, intended for British Army and RUC personnel monitoring the Bloody Sunday parade from the City walls, struck him on the head. Despite the best efforts of people at the scene to administer first aid, Charlie died upon reaching hospital. There was profound shock and sorrow as news of Charlie’s death spread throughout Strabane, Derry and further afield. Charlie was dearly loved by his family and friends and everyone who knew him attested to his kind and loving nature. To mark the 20th anniversary of the young teenagers death, the Breslin/Devine 25th Commemoration Committee set out to ensure that a fitting and permanent memorial be erected in his memory in Charlie’s home town. These efforts came to fruition on Sunday, as a parade led by members of Ógra Shinn Féin and accompanied by the Strabane Memorial Flute Band (of which Charlie was a member) made its way from Drumrallagh Estate to Townsend Street where, in a poignant ceremony) Patrick and Mary Love unveiled the memorial plaque in memory of their son. Paddy Jack, speaking at the unveiling and on behalf of the Love family, said that the tragic circumstances surrounded Charlie’s death were further compounded by the fact that he was a republican activist in his own right. 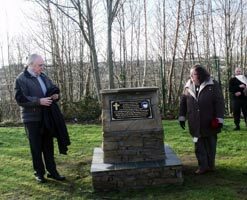 He expressed thanks on behalf of the Love family to the organising committee who had built the memorial plinth and the Bloody Sunday committee, who were represented at the commemoration.